For the past four days, El Salvador has watched as families in a marginalized, informal community have been evicted from their dwellings to make room for a luxury commercial and residential development. The families reside in Comunidad El Espino, on the western edge of San Salvador, and their story is an all too familiar one of the powerlessness of the poor against the plans of the rich and powerful, their lawyers and a compliant judicial system. Comunidad El Espino is located just south of Monseñor Romero Boulevard in the San Salvador suburb of Antiguo Cuscatlán. The community is adjacent to the headquarters of El Salvador's Ministry of Foreign Relations and across from a luxury development. All of this land was originally part of a large coffee finca called "El Espino" on the southeastern slopes of the San Salvador volcano. For decades, the land was owned by the Dueñas family, one of El Salvador's so-called "14 families." The Dueñas family was part of wealthy coffee-holding landowners who garnered large landholdings in the 19th century by expropriating it from campesinos. The El Espino coffee finca was originally 3400 acres of fertile land that was part of the communal lands that after independence in 1821 was the common property of the campesinos. But it was titled in the name of the Dueñas family in the 1880's and they appropriated the land to themselves. This was the epoch during which the grand landowners were born, who titled in their name wide expanses of the common lands of the country. From then, the campesinos who had cultivated these communal lands passed to being colones (sharecroppers) of the new owners. At the time of land reform in 1980, the land where Comunidad El Espino is located was transferred to back to a cooperative of campesinos. But when El Salvador's civil war drew to a close, parts of the land in the hands of the cooperative were transferred to the national and municipal governments and to the Dueñas family. In a series of real estate deals which followed, the Dueñas family made millions as the parcels of the land went for a string of luxury shopping malls and residential developments. From the end of the civil war, the residents of Comunidad El Espino lived, without legal title, on a portion of this land which continued to be owned by the government of El Salvador. During the term of president Tony Saca, the government entered into a deal to give to the Dueñas family the land where Comunidad El Espino is located in exchange for property owned by the Dueñas family which was in the path of Boulevard Monseñor Romero, then being built. Since they reacquired the land, the Dueñas interests have been in a legal process to evict the community and families who have lived there more than 20 years. Now having obtained their favorable ruling by a local judge, the Dueñas family is once again appropriating lands on which humble, vulnerable people have built their homes. 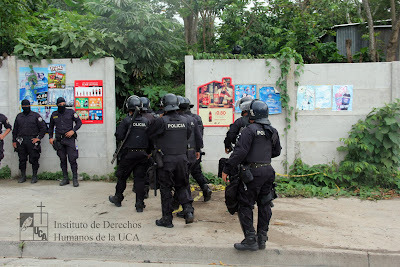 Riot police this week executed the eviction order issued by the Justice of Peace of Antiguo Cuscatlán, Rigoberto Palma. The Human Rights Institute at the Jesuit University of Central America (IDHUCA) has been providing legal accompaniment to the community. On its Facebook page, the IDHUCA shared photos of the process and decried a lack of humane treatment for the families whose belongings were deposited in the streets as construction crews of the Dueñas family. arrived to bulldoze the community. A photo gallery at the website of ContraPunto offers more images of the families being dislodged from their homes in preparation for demolition. The left wing FMLN government of Salvador Sánchez Cerén is staying out of the dispute. It announced that resources were available to care for the children displaced, and urged families to take advantage of a fund of $12,000 per family to seek new housing if the family had no other property outside of El Espino and $4,000 for families who had other property. The government also opened a shelter for the displaced families. The eviction of the people of El Espino, without foreseeing where they will be relocated, is a serious violation of Human Rights. 55 children will have to sleep in the street today. For the Dueñas, for their lawyer Perla, for the judge José Antonio Palma, the children, if they are poor, lack all rights. 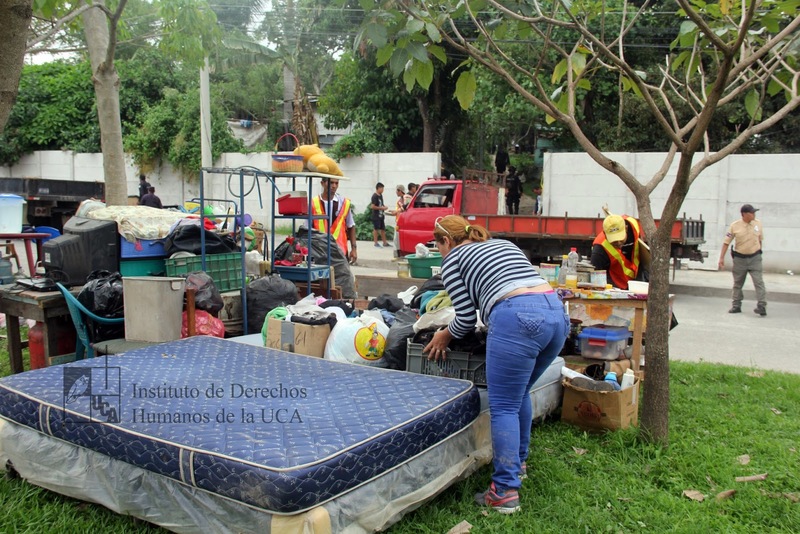 Human rights groups and advocates for dignified housing sent an open letter to President Sánchez Cerén demanding just and humane treatment of the evicted community members. Compliance with a judicial order, they argued, was no excuse for mistreatment and abuse of a vulnerable population, leaving them homeless and without appropriate protection from entities of the State. La justicia [en El Salvador] es igual a las serpientes. Sólo muerden a los que están descalzos. Justice [ìn El Salvador] is like the serpents. They only bite those who are shoeless.